What makes a global student? Click on the image below for the 2015 programme. The Warwick/UKCISA Integration Summit 2015 was organised jointly with the UK Council for International Student Affairs (UKCISA), the University of Warwick and Warwick Students’ Union out of a desire to increase collaboration between universities and their students’ unions. The main theme of this year's summit was 'What makes a global student?' Our focus is shifting to the student community as a whole and its potential to be ‘global’. We know that employers the world over are looking for graduates who can communicate effectively across multicultural teams and yet, even when universities and students’ unions are offering more international opportunities than ever before, students struggle to articulate their intercultural competencies, global outlook and skills in ways that are meaningful to employers. Leading academics and practitioners were brought together to discuss the latest thinking in this important area. Speakers included Professor Helen Spencer-Oatey, Director of Warwick’s Centre for Applied Linguistics and author of Intercultural Interaction and Culturally Speaking, and Professor Dr Juliana Roth of Ludwig Maximilian University Munich, Germany, who gave a talk titled 'The Internationalisation of Higher Education – a Change of Paradigm for European Educators'. Enhancing Intercultural Competence through Study Abroad and Reflective Learning, which focuses on optimising the rich intercultural learning and skills development that can come from reflecting on immersion in another culture. We hope that the Summit has given momentum to all the good practice, thought and research going on in the UK in the area of student internationalisation. The presentations of all sessions are available here. Click on the image below for the 2014 programme. Click on the image below for the Warwick/UKCISA publication on integration. This year's Warwick Integration Summit was again organised jointly with the UK Council for International Student Affairs (UKCISA) and the National Union of Students (NUS) out of a desire to increase collaboration between universities and their students' unions. It again also featured the NUS Internationalisation Awards. The main theme of this year's summit was 'Fostering a sense of belonging'. Leading academics and practitioners were brought together to discuss the latest thinking in this challenging area. Speakers included Professor Helen Spencer-Oatey, Director of Warwick’s Centre for Applied Linguistics and author of Intercultural Interaction and Culturally Speaking, and Dr Joseph Shaules, Director of the Japan Intercultural Institute and author of Deep Culture. These speakers' presentations are available here. The 2014 Summit saw the launch of the Warwick/UKCISA publication on integration: Promoting Integration on Campus: Principles, Practice and Issues for Further Exploration. Click here to download a copy. Staff at the University of Warwick are now in the process of setting up a community of practice across educational institutions on the topic of integration, so that working together, we can follow up on some of the key questions identified in the publication and discussed at the summit, so that we can report back at the next summit on developments. This year's Warwick Integration Summit was organised jointly with the UK Council for International Student Affairs (UKCISA) and the National Union of Students (NUS) out of a desire to increase collaboration between universities and their students' unions. It also featured the NUS Internationalisation Awards. The main themes of the Summit were promoting dialgoue between international and domestic students and taking a holistic approach to integration. Presentations from the 2013 Summit are available here. 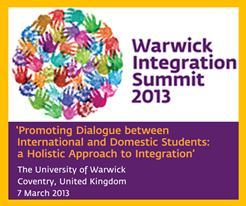 Click on the image on the right to view the Warwick Integration Summit 2013 programme. 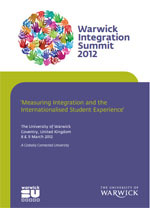 The University of Warwick and Warwick Students' Union jointly organised a two-day Integration Summit in March 2012. The aim of the summit was to examine how universities and students' unions can best work together to encourage integration between international and domestic students and embed a global perspective in all their students. Staff from the Centre for Applied Linguistics participated actively in the event, providing background information on relevant conceptualisation and research findings. You can view the presentations from the 2012 Summit Presentations page .